Perfect Parker Fadley isn’t so perfect anymore. She’s quit the cheerleading squad, she’s dumped her perfect boyfriend, and she’s failing school. Her parents are on constant suicide watch and her counselors think she’s playing games… but what they don’t know, the real reason for this whole mess, isn’t something she can say out loud. It isn’t even something she can say to herself. A horrible thing has happened and it just might be her fault. If she can just remove herself from everybody--be totally alone--then everything will be okay...The problem is, nobody will let her. I want to start off by saying, I LOVED THIS BOOK! I mean, LOVE, LOVE, LOVED it! And I have to thank Daisy, once again, for recommending another fabulous read. You're so awesome, Daisy! This was a very different read for me. Lately, I've found myself drawn to mostly paranormal YA (hmm... I wonder why?) 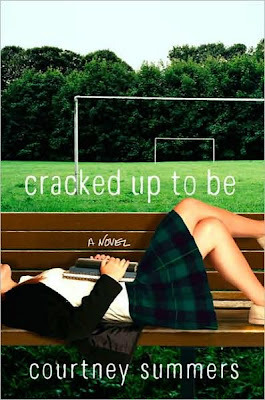 and I have to say, Cracked Up To Be was a nice change of pace. 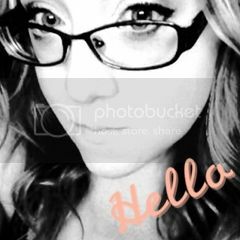 Courtney Summers has earned a place on my favorite YA authors list. Not that, that is such a hard thing to do. The only real requirement is... boys, (yes, I'm that easy. I know, I know) and this book surely delivers its fair share of scrumptious boy candy. Cracked Up To Be is the story of Parker Fadley. And as the narrator, she guides us through the mess she has made of her life while finishing her senior year of high school. This book is full of angsty teen tension (is there anything better?? Umm... I don't think so), broken relationships (normally this is sad, but in this book it's actually kind of sweet), emotional journeys, and acceptance. Oh, and I almost forgot to mention the most important part... the swoon worthy boy yummy-ness (Chris and Jake... sigh). 'Nuff said! And, as if that wasn't enough, Courtney's fresh and unique writing style pulls you right into the story. Her writing is real, raw, and ultimately hilarious. She portrays youth well and doesn't wimp out on the touchy issues (they're all there. Believe me!). But, even with all of that, I still believe that every book you read should teach you something. Anything. For example: Twilight taught me that you can still land the two hottest guys in town, even if you are a clumsy book nerd. And in Hush, Hush, hmm... well I'm not sure what I learned. I was too busy dreaming about Patch to notice much else. So, what did Cracked Up To Be teach me? Probably the most important thing, ever: there is no limit on the number of curse words I can add to my YA WIP. LOL! I highly recommend this book to everyone. Be sure to check it out because it's just that good. No, not good. It's fantastic!!! So, you must not miss it. Seriously, what are you waiting for? Go get it now! Wow it sounds really good! I might have to check it out! Sounds good! I will check it out! Ok, so I totally hate that I can't watch movies at work on my lunch break! AAAAHHH. Thanks as always for the review...only one more day 'till Friday! Woo hoo! OOOOHHHHH! New book to read! Yay. Wow, sounds like I should read it. Jen - You should. It's a great book. Tiffany - I'm afraid we may never stop drooling over Patch... sigh. Hot boys, check. Teen angst, check. Hot boys, check. Melissa - I hope you like it! Eva - Umm... hmmm. This is such a hard one. It has to be teens and angst, right? Okay, now you have to read SOME GIRLS ARE. Amaaaaazing. Kim!! So glad you loved this book as much as you did!! !